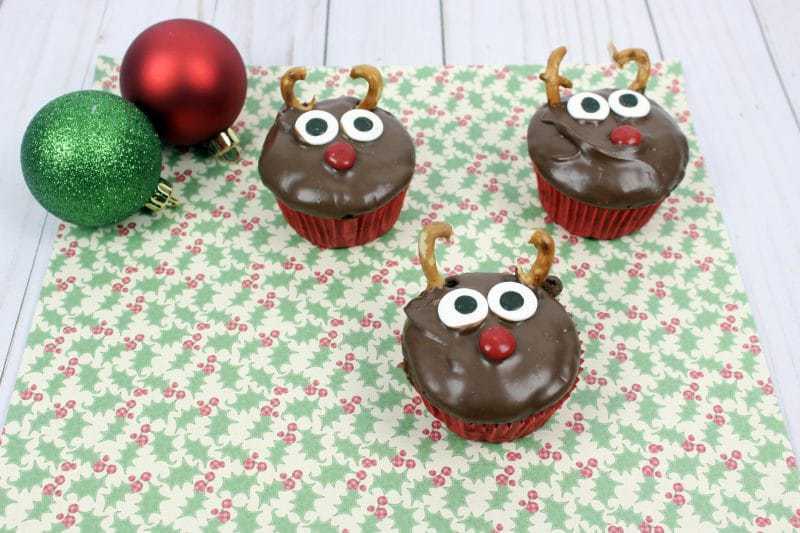 These cute Christmas reindeer cupcakes are ridiculously easy to make by decorating chocolate cupcakes with M&Ms, pretzels, and candy eyes. Do you love to make recipes with your kids? Spending time in the kitchen with your kids is not only fun, but creates wonderful memories. Whether you and your kids need something for a party or bake sale, cupcakes are always a great option. 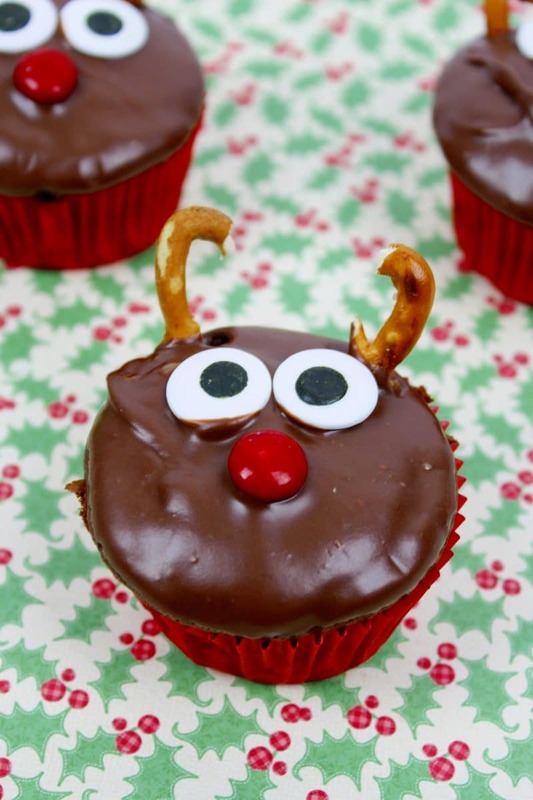 These Reindeer Cupcakes are fun and a must if you’re making something for kids. This isn’t one of those recipes where you have to make the cupcakes and frosting from scratch. This is a recipe that focuses on the decorating and starts with cupcakes made from a mix and store-bought frosting. This means that you can make these even on school night. In other words, if you kids happen to forget that they need something for a bake sale, until the last minute, these are perfect. Your kids will love making these cupcakes. And, if you need more than six, this is extremely easily to double or triple. You can easily make as many as you need. If you’re going to need a lot, you may want to make the cupcakes ahead of time and freeze. You can then defrost them and decorate. There are so many easy cupcakes you can make with very few decorations. Have fun with it. Remember, it’s more about the memories than the food. Frost cooled cupcakes with chocolate frosting. Break a pretzel twist in half to get a curved pretzel. 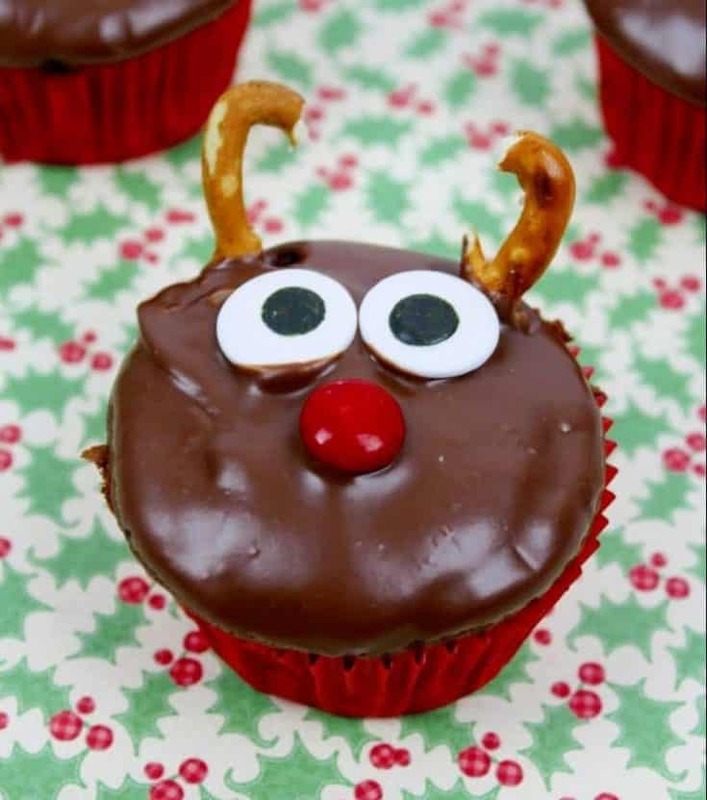 Insert at the top of the cupcake to serve as reindeer antlers. Place two candy eyes on the cupcake. Below the eyes, place a red M&M candy for a nose. That's it! Super easy, yet super cute! 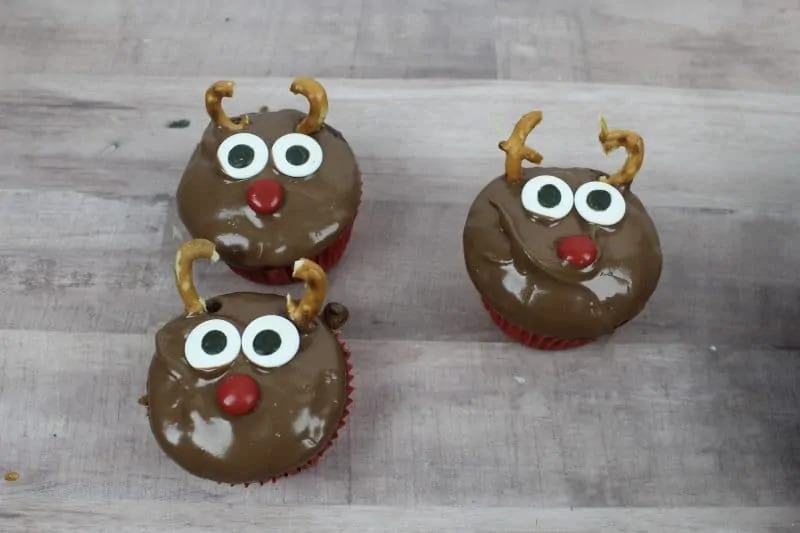 I hope that you enjoy these adorable reindeer cupcakes! These are so cute! 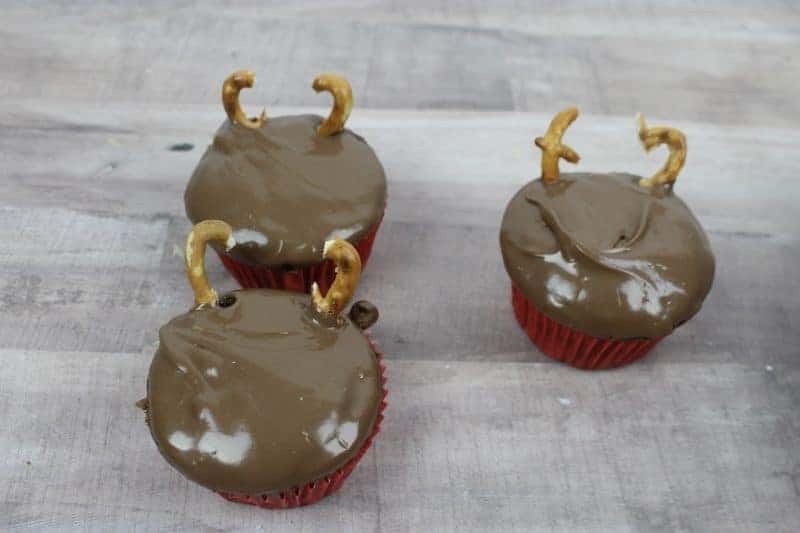 I love chocolate frosting too, so I’m sure these taste great as well! 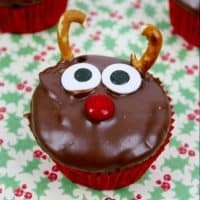 I love this reindeer cupcake. 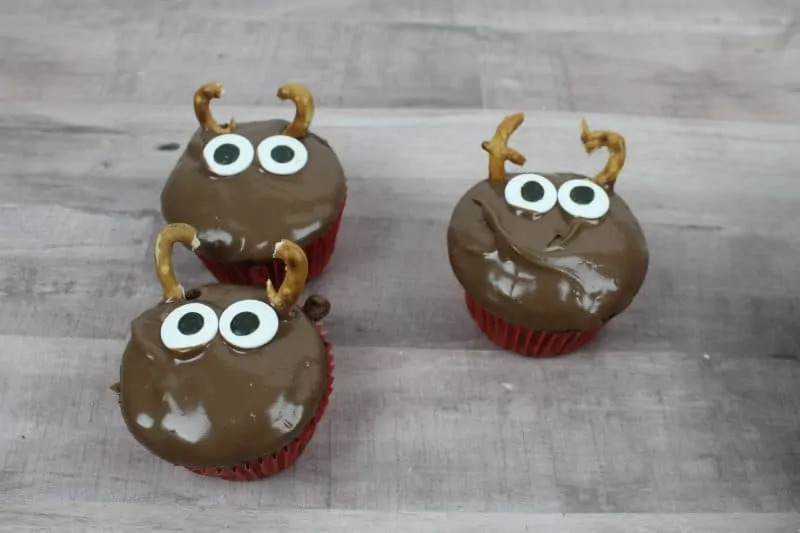 I like the reindeer cupcakes idea so much, I realized I could also do other animals, insects and spiders too. 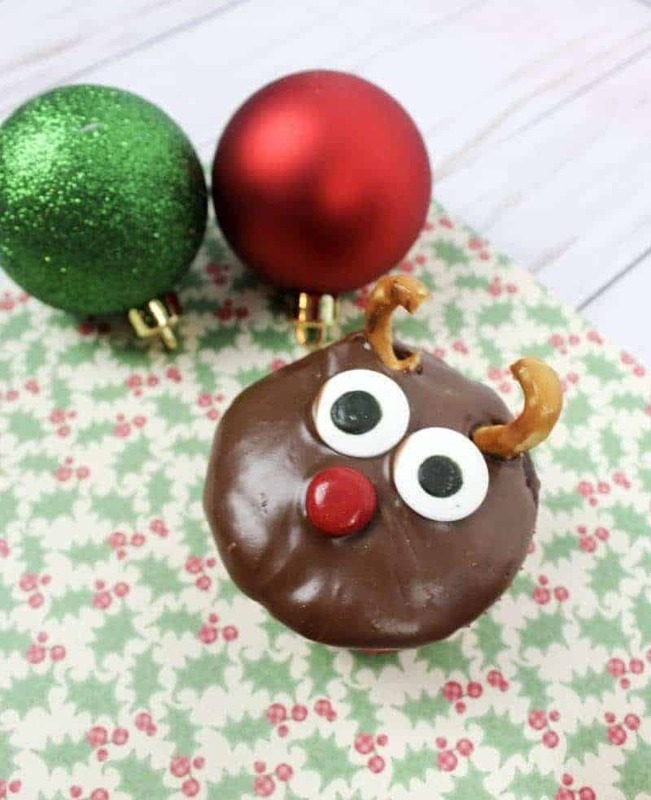 These are so darn cute with not much extra effort or expense. I’d love to try these, I can hear the oohh’s & giggles now.